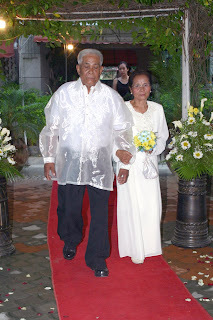 Today, my dearest parents are celebrating their 55th year of marriage. I am a proud daughter. Who wouldn't? I know what they've gone through. I know it wasn't all sweet and smooth but I am proud and happy they chose to be together and honor the commitment they made 55 years ago. Happy 55th Wedding Anniversary to the most wonderful parents in the world. we love you! and this oh so sweet picture was taken on their 50th golden wedding anniversary 5 years ago. Those pictures are priceless! They are indeed blessed to celebrate their 55th. Here's to many more!